I really do enjoy the freedom of summer. The break from the relentless and mundane school related routines affords self-granted permission to chill, to take things at a far leisurely pace and to engage in some fun trips and activities. The school summer break in Ireland is quite long, with approximately two months off for primary school children and three for those at second-level. It stretches endlessly in front of you at the beginning, until suddenly you blink and it's all over. Your pride and joy is back to school and has almost completed his first two weeks, and all in a heartbeat too. It's a shock to the system, this back to school lark - for all of about five minutes and then it's like the new norm. 1 - The summer finally arrives! And given the long summer break here I claim this one as an Irish phenomenon. Seriously, it's guaranteed. Every year. It will rain for days during the endless summer but as soon as a child steps back into a school the sun comes out - and stays out! And it sure came out in style this year. Almost two weeks later and we are still, intermittently, in the midst of our hot Indian Summer. The sun is shining and the temperatures have soared. SOARED. And it is fabulous! For as long as it lasts. 2 - The demise of the Late Nights. No more the all late night TV and Netflix viewing, nor the online activities. I refer not only to the school-going person here. 3 - The return of the dreaded early morning alarm - and consequently the end of the summer lie-ins. Note that 9.00 or 9.30 am constitutes a lie-in, and it is very much mourned when your sleep is once again so rudely broken by that annoying and very insistent 6.45 am beep-beep-beeeeepp ! 4 - The end of the mid-week wine. Come on, admit it. There has been a little of this during the summer now hasn't there? Well, no more. It ends now! And the eating healthier regime begins anew. 6 - Sunday night ironing fests. Which kicks off with the Friday evening dash to get the school jumper and trousers into the washing machine. The Sunday evening drudgery of ironing school and work shirts etc., soon follows suit. To the tune of some very mindless TV, I might add. There may even be a well deserved cheeky glass of wine. And all is set for another week. 7 - The Fishwife Moments. They'd pretty much disappeared over the summer but can return with fervour, at a moment's notice, from the very first back-to-school day. You do know these moments of which I speak, right? You know.... the very shouty: 'GET OUT OF THAT BED/GET DRESSED/GET INTO THE CAR/DO YOUR HOMEWORK .....NOW' moments. Then again, mature 5th year students keep that particular lady in abeyance. She's ready for action when required though. Do not be complacent. 8 - Routine. Back-to-school means back to the dreary daily routine..... and the shock realisation that I actually like it. Not just like it, thrive on it. Oh gawd, did I just type that out loud? Of course no self-respecting child/teenager would so readily admit to that. But they do like it, and most (not all) feel some excitement, along with understandable trepidation, at the challenges and rewards of the school year ahead. 9 - Quiet . Can you hear it? The peaceful sound of silence in an eerily empty house? You can, if you're a stay-at-home-mum. One who doesn't have to stay at home too much now that school's back! Along with the peace comes the freedom. The freedom for more regular catch-ups, walks and classes. Although in fairness, with a self-sufficient teenager, this can still be done during the summer. But at least now I know his time is more appropriately occupied ;-) And of course the daily homecoming of the hard-working student is much anticipated and the imparting of his news and travails dearly cherished. 10 - Back-to-School Bugs. As sure as no.1 is a given this final one is an absolute certainty. We lasted a week, and finally the student has succumbed, is out sick and a GP trip is in order. Another legitimate back-to-school cost I wonder?! 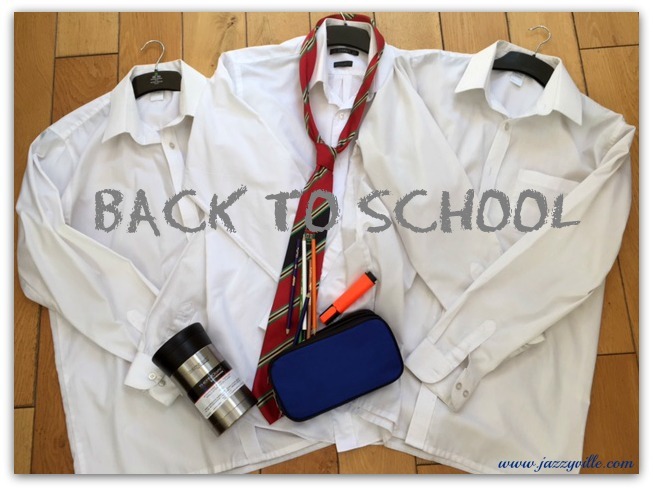 Back-to-school means different things to different families. This is what it means to me ..... and I really am shocked at how much I like being back in a routine! I'm even more shocked at the fact that, along with the freedom breaks, 'stuff' is getting done. A lot more 'stuff' than was done during the summer, it must be said. Perhaps it's the break from routine that makes one appreciate them more? In that case I'll be sure to take some regular breaks! Meanwhile, as not everyone has the same experience with school, I'll take this opportunity to wish you and your family a successful back-to-school experience, and the very best of luck for the year ahead. @Office Mum: I often think that too, about moving the school holidays. But then I think..... sod's law. You just know what would happen if we did?! So true, every single point. We went back to school for a week and them came to London for a fortnight so we've got to do it all over again when we get back.